Healing is what we do. 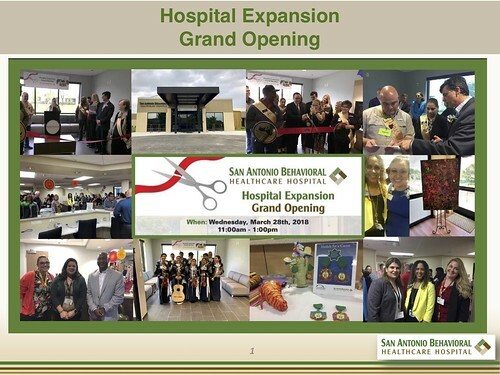 SAN ANTONIO, TX- On Wednesday March 28, 2018 San Antonio Behavioral Healthcare Hospital (SABHH) was honored to host approximately 100 leaders in the behavioral health community and regional stakeholders for a grand opening event to commemorate its 90-bed hospital expansion. The estimated $9 million expansion project nearly doubles the hospital’s total beds to 198 making it one of the largest and most comprehensive specialized behavioral healthcare facility of its kind in South Texas. The acute care psychiatric and substance abuse treatment facility serving adolescents ages 12 to 17 and adults ages 18 and older. As part of its expansion, SABHH plans to expand its services to also care for pre-adolescent children from 9 to 11 years old. SABHH also has plans to begin offering Transcranial Magnetic Stimulation (TMS) services to patients experiencing acute depression. TMS uses a non-invasive targeted pulsed magnetic field while a patient is active and alert to stimulate areas of the brain that are underactive in depression. Other specialty programs and services will be introduced to meet the mental health needs of the community. The event featured announcements of new and expanded specialized services that will be offered to better meet the unique mental health needs of our community. The demand for behavioral health is on the rise at a time when the city’s existing behavioral health resources are strained and many times at capacity. These extra 90 beds represent an increase of 11.5% in the number of available behavioral beds in the city of San Antonio. “We are excited to be able to bring additional services and capacity to the market and be in the position to serve as a resource to our patients and partners in South Texas,” said Aleen Davis Arabit Chief Executive Officer at SABHH. SABHH is an active member of the behavioral health community and has nurtured relationships with various groups to better understand their unique needs and be able to cater to their constituents which include school districts, universities, military installations, mental health authorities, law enforcement, mental health support groups and partners in the healthcare industry. SABHH is committed to meeting patients where their needs are. The expansion will enable us to serve more people in need and allow us to develop new specialized programs such as middle school programing and day treatment programs to better address the needs of the community, said Kristin Arnold Director of Clinical Services at SABHH. The event also included a plaque presentation and ribbon cutting ceremony led by Aileen Arabit CEO of SABHH and Emy Aquino Ambassador of the San Antonio Chamber of Commerce who was accompanied by a delegation of the Chamber’s Ambassadors. After the ribbon cutting SABHH invited guests to tour the new areas of the hospital. With Fiesta 2018, just days away the hospital decided on a festive Fiesta theme. Paintings and Fiesta decorations created by SABHH patients were exhibited and part of the interior décor of the hospital for the grand opening event. Tours highlighted the latest features and characteristics of the city’s most modern behavioral healthcare facility. Our hospital has been recently featured in the Huffington Post in this article: 10 Ways to Combat the Devastating, Productivity-Killers of Mental Health Crisis and Substance Abuse. SABH is now offering an Adolescent Partial Hospitalization Program (PHP). The Adolescent Partial Hospitalization Program (PHP) is a day treatment program that serves teens, ages 9-17 years old, who have recently been in an acute setting or those who require structured treatment and psychiatric support.